On Tuesday, January 22, 2013 when Vincent Medley, San Antonio Animal Care Services Assistant Director, dragged frightened dogs from a home during a seizure. Instead of bringing crates to the dogs, Medley and his sadistic employees utilized catch poles and rope nooses to parade the seized dogs in front of media cameras. Medley noted in multiple media reports that ACS was aware of this neglect and cruelty case for months and even a year. Yet ACS still allowed the owner to continue to abuse and mistreat these poor dogs. ACS has a documented history of abusive handling of animals under Medley’s leadership. Accordingly, Medley needs to be fired and charged with animal cruelty. Most likely, ACS will kill the seized dogs instead of releasing them to rescue. As long as the dogs are considered evidence in an ongoing investigation, it is easier for ACS to claim the dogs had “issues” that required immediate euthanasia instead of holding the dogs for the duration of the investigation. Mark my words. Please email San Antonio Mayor Julián Castro’s Chief of Staff at robbie.greenblum@sanantonio.gov. Ask that the mayor instruct ACS Director Kathy Davis to charge Vincent Medley with animal cruelty and to immediately fire him. Also ask the that the dogs be evaluated by an independent vet before euthanizing them. ANYBODY WHO HARMS, HUNTS AND KILLS ANIMALS ARE SICK IN THE HEAD, THESE MONSTERS SHOULD BE MADE TO SUFFER AND HAVE DONE TO THEM WHAT THEY DO TO THE ANIMALS……. I’m outraged not only by the waste of life who treated these poor dogs that way but by the way these animals are being removed from this house. These dogs were ABUSED & these “animal control officers” are DRAGGING them on gravel like they’re nothing! I understand the dogs did not know how to be on a leash or be near strangers but why not remove them in cages?! Dragging them on the ground by their necks is just as bad as what they’re so called owner did to them, in my opinion. It also sounds like this “owner” received too many warnings. These dogs should have been removed a long time ago! Disgusting! Well, now we know why many dogs come in with all of those cuts and road rash looking scabs! SA MUST stand up and insist our pets are treated better, with respect! These are abused LIVING things! Show Castro this video! Let’s see how much of an animal activist he is for San Antonio after viewing this..does TX even know how bad it is to be a four legged friend down here? 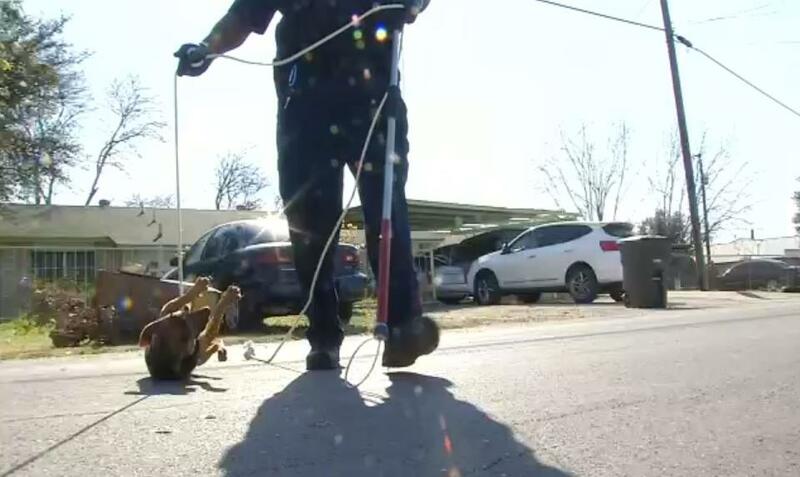 San Antonio is neither NoKill nor kind to its dogs and cats…this is a disgrace and politicians need to get involved if they want to keep their jobs! Speak on it stay on it. We are all GOD’s creation. I don’t understand as to why even bother getting the Animals out of an abusive situation !! Looks like just more Abuse coming so what good is all this !……….. It is absolutely DISGUSTING !! So, now that this monster is in charge of ACCT Philly, does that mean I should write to the mayor of Philadelphia to get him removed? I got my dog there and I will continue to get my dogs there because they need the most help and are always the most crowded shelter in the area. I do not want this waste of oxygen going near those innocent dogs. I’m embarrassed that the city of Philadelphia even allowed this P.O.S to work at ACCT with a background like that. we will do everything to get this murderer out of acct philly shelter. I love the animals & they know it. Murders who murder without regard or love of life! F@ck them dirty bastards. Rot in Hell. Assholoz.